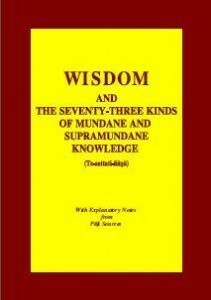 The Seventy Three Kinds of Knowledge describes at a glance the knowledges Buddhas and their disciples gain in the attainment of mundane and supramundane states. Since these knowledges are, as a Summary, very briefly stated, the present translation has explanatory notes in order to facilitate the reader understand them, at least intellectually, more easily. These explanations are based on the Pañisambhidà-magga, the Visuddhi-magga and their corresponding commentaries, and their references are clearly distinguished. The translation of each knowledge is repeated in the notes, in bold, for convenient reading.